Recognizing that health is determined by a variety of interrelated factors, states are looking to connect health care, public health, and social services to help achieve improved population health, better care, and reduced cost of care. This issue brief describes three essential components for integrating health, including physical and behavioral health services and public health, and social services: 1) a coordinating mechanism, 2) quality measurement and data-sharing tools, and 3) aligned financing and payment. 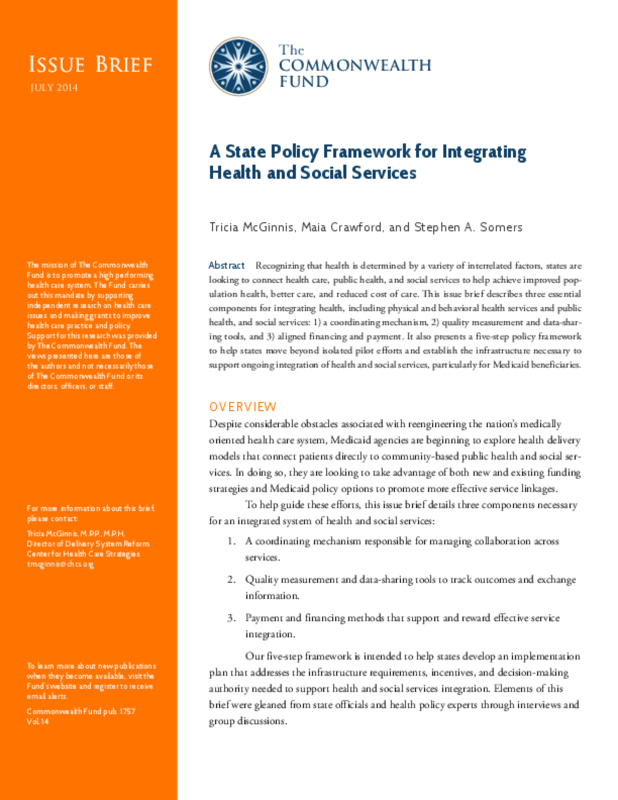 It also presents a five-step policy framework to help states move beyond isolated pilot efforts and establish the infrastructure necessary to support ongoing integration of health and social services, particularly for Medicaid beneficiaries.